NOTICE! NEW TOPIC IS READY! Well everyone, before i begin, i would like to give a brief explenation.For quite some time now, i have hoped to start up a Choose Your Own Adventure, or CYOA.Recently, i have noticed a slight gain in popularity of this sort of comic - and, i assure you - i've had this idea for quite a lot longer, and have just recently managed to improve my skills as a spriter and artist to pull this off - of course, i still have plenty of room for improvements. I have seen several CYOAs, and i intend to keep references to them at a minimal - unless, of course, someone sends me an 'action' related to one. Some basic rules are as follows:1. Character 'actions' must be adressed to the character's name, once other characters are introduced. I.E <Name>: <action>2. Action commands should be sent in PM, to remove clutter to the topic.3. If you are interested in any sort of cameo appearance, be it recurring or singular, please PM it to me, so as to keep the topic relatively clutter-free. Cameos must include spritesheet, either chimoru Sixshade, Kal, or R, i won't accept any others, as well as their name, action-command abbreviation, description, and powers. Cameos can be either a Simple Cameo [Equivalent to GS, may be in a few strips, or be a background character], or a Lasting Cameo [Equivalent to PGS, will be recurring character and should be around for awhile.]4. I am most likely to post each new 'comic' in a new post, as putting them in links would sort of... 'ruin the effect'. [AUTHOR NOTE: Update frequency depends on, for the most part, how many action commands i recieve in PM! So, please don't not-send me a command just because you think someone else already has - it may or may not be very likely, although sometimes i may be already working on the comic. Keep trying though, for the sake of the comic! ]PLEASE KEEP IN MIND.Once you become a cameo, your character will be at the whims of those who give action commands, and the whims of how i play things out. In this sort of comic, it's something that has to be done.Regardless, i will try to keep what happens to the character within their... 'description'.Current Lasting Cameos:1. King Joe2. Justax-Kal3. Soran4. Utah5. Facade(Technically closed, but, feel free to send in a request. I might be able to use you at some point. )Current Simple Cameos:1. JiMing2. RO - (Ptolemaios)3. Open4. Open5. Open(People will be removed from the CSC list as they are moved out of place by newer CSCs, to keep in track of the latest ones. )Current available people for ACsLeraku: LERJustax-Kal: JKKing Joe: KJUtah: UTSoran: SORFacade: FACACS are enabled for everyone at the moment.Trophies:Soran's SANDWICH trophy Utah's JOLAND SEAL OF APPROVAL trophy BannersSeason One banner Season Two banner Season One fan banner by Soran (Image is too large, please click first link for Soran's fan banner) Season Two Banner ReduxFeel free to contribute a fan banner!And now...Dents.Dings.and Disasters. An orange matoran has awoken on the beach. Nearby is what looks like a large boulder, and far off, further down the beach behind him, there seems to be an odd collection of 'lilypads'.He can remember his name, but he does not seem to know why he would want to recall it. He knows it after all.What will you do? Edited by Black Six, May 20 2014 - 07:21 AM. IMPORTANT EDIT: For some reason, i don't seem to be 'allowed to use the private messaging system'.Which i find... well, odd, to say the least. Until this is resolved, i'm not sure how this comic will be able to be progressed aside from input on DeviantArt from some of my aqquaintances. Any suggestions/help? You can't use the PM system because you're in the New Members group (more information on that in the second section of this topic). You'll need to make ten counted posts (not in Q&A, Voting Booth, Games & Trivia, Shops & Kits, or Completely Off Topic) before you'll be put in the regular Members group with the ability to PM.You've got seven already, so three hopefully won't take long. Sets and General Discussion are good places to go if you're looking to make a few posts. Until then, there's not much you could do on BZP to take suggestions. This is why we love Windrider. Edited by Ziko, Jan 20 2012 - 07:24 PM. This is my mistake; I added a note saying that action commands should be PMed. Obviously, however, I somehow failed to register that Leraku is in the New Members group. I sincerely apologize for this confusion.Let me say, therefore, that those interested are allowed to post action commands for now; however, please be sure to include feedback on what is already posted as well. That is, an action command should be part of an otherwise legal post.I must apologize once more! I am not a clever person. As partial recompense, allow me to say the effects you used for the cirrus and cumulus clouds are excellent. In addition,> OM: Slowly get to your feet, and, striking a classic searching pose, gaze into the sky. Edited by -Windrider-, Jan 21 2012 - 02:44 PM. Thanks a lot. I had read the rules at one point - but, i suppose i should give it a quick re-read! Never hurts, after all. Anyways! On with the show.>OM: Slowly get to your feet, and, striking a classic searching pose, gaze into the sky Thus far, he has done well, and, gazing in awe of the beautiful sky, seeks - OW WHY DID YOU FORGET YOUR TELESCOPIC SCOPE ON YOUR MASKOW OW OWSTUPIDWhat will you do? Edited by Leraku, Jan 20 2012 - 10:12 PM. Thanks for the feedback, i'm looking forwards to actually having a successful comic series for once.>OM: Rub your eyes and walk to the right. OW OW OW. Which way is right again? Oh. Maybe you shouldn't walk with your eyes closed... What's that up in the corner?What will you do now? This looks fun. It should become even more so when you reach standard member status. Also, I echo what Reznas said about that effect, it's a little off.OM: Attempt to build a ladder out of your arms, some duck tape, a bit of string, and chewed bubblegum.This should be after Reznas's post. Yeah, i'll admit, the effect bugged me a bit too - i guess i forgot to fix it. I'll keep it in mind from now on, thanks! [EDIT: Also, keep in mind, don't feel like you can't make a post just because it seems a little out of character range - i have been, and will be making edits to OM's spritesheet for custom poses, for when the action calls. I even made a custom 360 spinny using the basis of the 6-shade chimoru combined with Chimoru Kal, to give him maximum posability when it comes to looking at things in the background and such - unfortunately, i hadn't made this at the time of the 'look-at-the-sun' post, i just made it today. I'm not sure why i did, but, i guess i gave him a side-kick pose? Oh well! Thanks for all of the input. ]>OM: You turn to the left and see a hammer. How will you get it down? Odd ideas of jumping and ladders - involving his arms [which he really would prefer to keep snugly attatched to his torso], objects that he doesn't even have, or necessarily don't even know of - fill his head, but he does not know why he would do this! After all, it's only his trusty HAMMERSPACE! He keeps his items in his HAMMERSPACE, since he often needs his hands free, though he usually keeps it tucked away with a hammer icon. Inside are 6 red spaces for placing items, and two arrows - which cycle through his selection of items. They don't work right now though - he only has two items with him at the moment! His PROTOSWORD and his trusty POINTY OBJECT - which he obviously needs for opening small containers that happen to be very stubborn. Or... stabbing, whatever works. It could be a knife. All MATORAN need something to defend themselves with, and disk launchers have never been his choice.Now what? Edited by Leraku, Jan 21 2012 - 12:37 PM. Ooh, er. This looks quite interesting. I like the idea of a properly constructed comic in the form of an old text RPG. As long as you have some sort of structure to keep it from going off the rails, I look forward to more. I'll be following.>OM: Take out the little pointy object and stab the rock. If it reacts, stab it again. Edited by Kakaru, Jan 21 2012 - 04:00 PM. >OM: Attempt to use hammer icon on large boulder in your path. Since he can't grab the hammer icon anyways, he decides to try and use his sword to stab-ify the bould- Wait, that's not a boulder it's a mountain... or, a volcano. With a castle? And... a lava moat? Who builds a castle over a lake of fire? Maybe the same crazy people who burned that forest over there. And who's this fellow? [Author note: Yeah, this isn't really my best background. But hey, practice makes perfect, so i'll keep trying with stuff like this.] Under the light of the volcano, you decides to walk up to this strange person.He seems interested in coming along on this journey of yours! Introducing himself as... King Joe? hm. Odd name, wonder what he's king of. Well, anyways, he queries if you would allow him to come along and join your MATORAN COMPANY.Of course, King Joe! 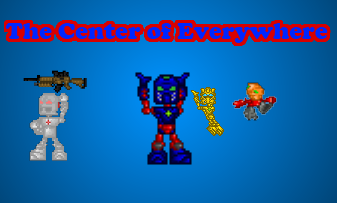 Your name is...What is the orange matoran's name?==============================================Well now, i would like to make an announcement.As i have now made it to the 10-post mark, all Action Commands must be sent by PM. I will update the topic soon after i have set this in. 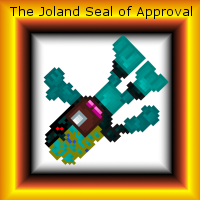 Seeing as someone already recognized this factor and sent in the next action command via PM, and that they have agreed to become the first 'Lasting Cameo', King Joe will now be a part of this adventure, and, as per request of King Joe himself, will be able to be given an action command via 'KJ: <command here>'.Secondly, other cameo appearances are allowed, send me a PM about it.It will require the Spritesheet [Chimoru Sixshade or Chimoru Kal, i don't have time to run the comic and reshade someone's sheet both. ], Character name and description, and powers.It can either be a Simple Cameo, [Equivalent to GS, may appear in a few strips, or maybe a background character] or a Lasting Cameo. [Equivalent to PGS, recurring character and often in main strips. 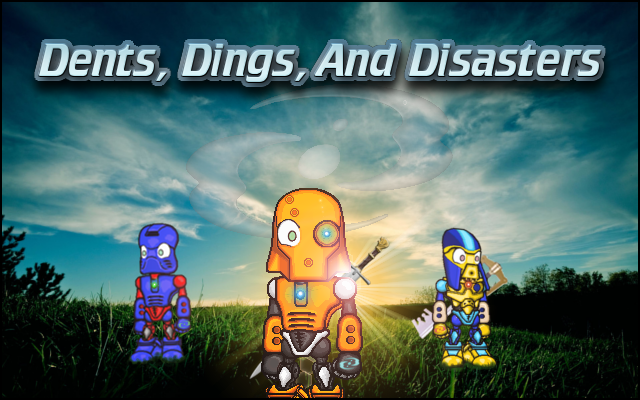 ]Also as of note, i have completed a banner for DDD, feel free to apply it to your signature! Here's where it's located, so you can link it.EDIT: I haven't been able to link-image-code it for some reason, so i'll leave it be. Edited by Leraku, Jan 21 2012 - 04:12 PM. This looks great. 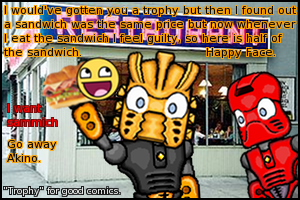 Your first series and you already have a grasp of GIMP, a nice style, and good humor. I can't wait to see it grow!Also, thanks for bringing to my attention the lack of 360 for that pose. Considering it's the one of my main character, you'd think I would have made it. I'll be sure to have one done by tomorrow.J-K out. Well, this technically isn't my 'first series', i had several old series on my old account - and back then, i was a serious amateur.I decided to start slate-fresh, and give it a go this way! I also decided not to make another series till i thought i was good enough at spritework and such.Also, you're welcome for the 360 deal.Since it wasn't available from the Kal sheet i got, which, i can't exactly remember where i got it from... Either ways, i decided to try and make a 360 spinny using the six-shade sheet and then applying the Kal details. Mind sending me in PM the updated sheet? Edited by Leraku, Apr 15 2012 - 06:18 PM. EYEBEAM MAKES EVERYTHING COOLERJoking aside, I like this, will definitely be keeping tabs on this. Edited by JiMing, Jan 21 2012 - 08:02 PM. >KJ: Declare yourself as awesome. Knock it off, Leraku. You're not the awesome one.King Joe is the awesome one. And also...EDIT: Whoops, looks like the image here got all broken. Sorry, can't fix it right now.So is this guy. They both don't know what's going on, but... well, whatever works. [Cameo: JiMing]What will you do? Edited by Leraku, Jun 02 2012 - 12:33 PM. I just KNEW that you would capitalize on the color similarities. :PSo THAT'S how cameos are going to work, I was wondering about that. Epic eyebeam is epic. Get owned Leraku's not-name.Man, you're updating this like crazy!J-K out. Yeah, i plan on updating frequently till things even out, besides, this is fun.So, i can't give guarantees on how often i'll update, or how many panels per update.I'll simply add panels as i see fit.Expect an update soon, i'm getting to work on the next panel. >KJ: Hatch incrediblely contrived and needlessly complicated plan for storming the castle with its lava moat. ...Thank goodness for mask powers...What will you do now? >LER: Toss King Joe across moat to see if it is safe (and possibly use him as a raft). Thoughts of colleague-based testing come to mind, as he is not sure how he will cross the lava past the outer wal- Oh, look. There's a bridge.What now? Edited by Leraku, Jan 22 2012 - 12:37 PM. King Joe is so caught up in his thoughts, he doesn't even notice that he being tossed quite possibly to his doom. LER: Toss King Joe across the bridge to see if there are any traps. What traps? It's only a bridge.Oh, and i guess KJ's awake now.And now? Edited by Leraku, Jan 22 2012 - 06:48 PM. >KJ: Throw Leraku down on the bridge in revenge. THIS WAS A VERY BADLY THOUGHT OUT PLAN Oh hey. Some guy is interrupting the re-revenge. Okay, calm down. This sword isn't energized anyways... you were only going to whack hi-What's that hurtling towards you? Oh gosh. Seeing what you just did to King Joe, I regret asking to join. And it looks like it's too late to withdraw.At least I'm in the castle! I can't wait to see your explanation for that. Can't wait to see my intro, but I think entering commands for myself would be cheating. I'll let someone else do it.J-K out. Edited by Justax-Kal, Jan 22 2012 - 05:47 PM. Actual feedback time. =0The thing that stands out the most in these, especially the newest ones, are the effects you're putting in. They all look very good, and the shining/dark clouds set the mood well. I also like the effects you used for your mask power and eyebeam (that was awesome =P). As far as the plot goes, I think you've got just enough for it to be interesting and, with the newest ones, suspenseful.Nice work, Leraku. Edited by Ziko, Jan 22 2012 - 05:59 PM. I forgot you had a sword and a pointy thing.Thank goodness for people saving my life! Don't worry about it. I'm not going to be killing anyone off - haven't you heard of a sword-whack? Heck, Leraku may be a tad on the irritated side, but, he's not going to just up and hurt someone like that. And also, feel free to add commands. In fact, KJ himself has been doing the last few commands, so, it's completely fine! In fact, feel free to quick-send me a command or two before i get going on the next comic. Actual feedback time. =0The thing that stands out the most in these, especially the newest ones, are the effects you're putting in. They all look very good, and the shining/dark clouds set the mood well. I also like the effects you used for your mask power and eyebeam (that was awesome =P).As far as the plot goes, I think you've got just enough for it to be interesting and, with the newest ones, suspenseful.Nice work, Leraku. Thanks a ton - i'm overwhelmed and appreciative of all of this incredible feedback, and how well this has been taking off! Save your life?See top quote. Edited by Leraku, Jan 22 2012 - 06:47 PM. >KJ: Thank mysterious person profusely for saving your life. Hm. Seem's he's a tad busy dealing a keyblade to the face. Wow... this is surprisingly awesome. HAHAHASILLY GUYS.STOP THAT.JOE IS CLEARLY THE ONLY AWESOME ONE HERE.Okay, uh... what now? Edited by Leraku, Jan 22 2012 - 09:32 PM. Okay... woah. [moment of awestruck silence]The smoke, the blur, the duel poses. All of it was fantastic. You've inspired me to but more effort into my series's graphics.That's my new catch phrase. "Sorry, what did you say? I was too busy dealing you a keyblade to the face! "Still, getting owned by Joe that easily is a disappointment.J-K out. That is right, I haz all the awesomezzzzzzzz!Still fantastic work. I am loving this. That's my new catch phrase. "Sorry, what did you say? I was too busy dealing you a keyblade to the face! "J-K out. Hey, anyone would be surprised if you were suddenly dealt FIREBALLTOTHEFAIC in the middle of an epic clash. >LER: Team up with mysterious person and beat the tar out of King Joe That sounds like a good pla- No, nevermind. He already took the initiative.Hmm... you know, fighting in a volcanic area is actually pretty neat looking. Yeah, you think you're going to just let this play out-OW THAT LOOKS PAINFUL.OKAY, NEVERMIND. TIME TO INTERVENE.Maybe negotiate or something, might be able to grab another company member.Negotiate? AAAAAAGUH! PAIN PAIN PAIN PAIN PAIN!!!! !MY AWESOMENESS IS BEING WOUNDED! >KJ: Attempt to take cool Keyblade from Mysterious Person and infuse it with your awesomeness. Whoops. Guess you can't reach it, you're too busy being TELENEGOTIATED.JUSTAX-KAL has joined the Matoran Company!Action commands are now able to be submitted to him via '>JK:'[Re-cameo: JiMing]Into the cave up ahead? Well, looks like you forcibly made someone join your party. :PAnd I appear once again. Yay! Dang it. If I ever decide to attack you again, my first move will be to remove your mask.Nice background gag with JiM too.Wait! I just reread and found text. IN THE PANEL!That stinks. I love peanuts.J-K out.